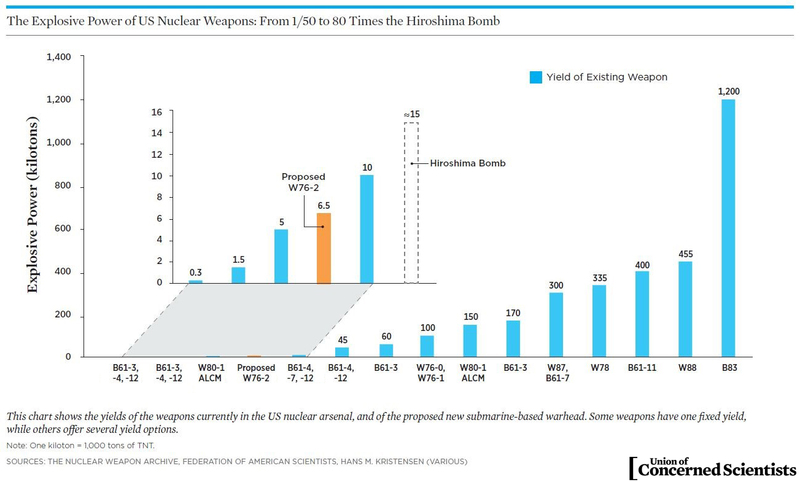 The W76-2 warhead increases the probability of nuclear use. Current US nuclear weapons have an astonishing range of explosive yields—from 50 times smaller than the bomb dropped on Hiroshima to 80 times grater. Despite this, the Trump administration plans to produce a new "low-yield" nuclear warhead, dubbed the W76-2, which will be attached to missiles and deployed on US submarines. The W76-2 is both unnecessary and dangerous. The United States already has weapons capable of similar yields; adding another will introduce complications that could lead to miscalculations. For example: all US sub-launched missiles currently carry only warheads with large yields. A missile carrying a lower-yield warhead like the W76-2 would look exactly the same to an adversary—it's impossible to distinguish which type of warhead it's carrying. If a US submarine launched the W76-2, a target country—such as Russia—would not be able to tell whether the incoming missile was a tactical escalation in a conventional conflict or the first move in a large-scale nuclear attack. They could easily assume the worst, and respond in force—leading to an unintended nuclear war.